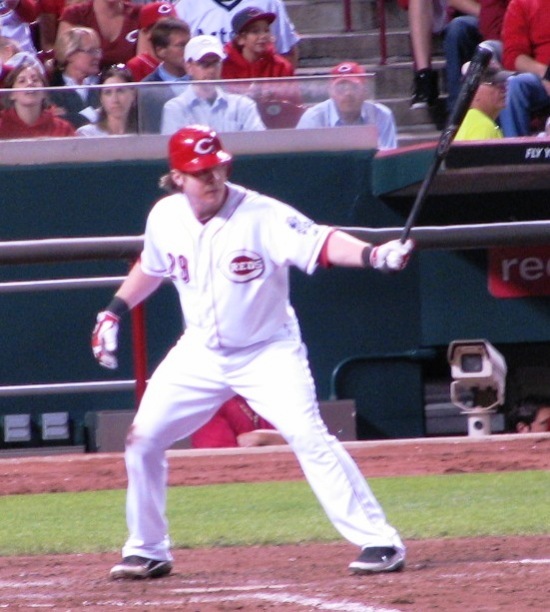 The Cincinnati Reds activated catcher Ryan Hanigan from the disabled list before Friday’s game, and he was in the lineup to catch Tony Cingrani. And he showed that he’s healthy. Before heading to the DL, Hanigan was miserable at the plate. In 38 at bats, he had 3 hits with a terrible .079 average. With his 5 walks, his on-base percentage was at .182, half of his career percentage. But in his return to the lineup tonight, Hanigan went 2 for 4, nearly doubling his total number of hits on the season. And one of the balls he hit was the hardest ball I’ve seen him hit all year. Of course, bringing Hanigan back means it’s time to say goodbye to lovable mustachioed mascot Corky Miller. Miller’s an entertaining, larger-than-life personality who just isn’t quite good enough to be a major league backup. It’s too bad, but I do hope to see him coaching some day. Until then, the Reds are one step closer to full strength, with pitcher Johnny Cueto and outfielder Chris Heisey both a few weeks away.